I cannot imagine that you are not already aware, but the 2018 Season of BattleBots is coming to an end. The Final Four will be fighting it out this Friday on the Discovery Channel. I know I’m excited, as I have been following this event for many years now, however, this year is especially exciting as we have an ALL-SOLIDWORKS Final four. All four bots were designed using SOLIDWORKS: Lock-Jaw, Bite Force, Whiplash and Minotaur. Winning the Giant Nut at a BattleBots tournament requires a tough robot, a skilled driver, and sometimes a little luck. I interviewed one of the final four, Paul Ventimiglia (Biteforce team leader), during this year’s event, and he opened up about what happens behind the scenes as well as some other interesting insights about BattleBots. Paul is a long-time roboticist and contender in BattleBots, and I had the opportunity to meet him years ago. We have stayed in touch, and I had a chance to ask him some questions about competing this year with Team BiteForce. I don’t want to share too much detail about my interview now, but it’s all in the podcast. If you’re a BattleBots fan like me, or interested in how they design fighting robots, I think you will want to hear more about all of the excitement from outside and inside the arena. Paul also talks about how he designs robots for his career and mentoring other robotics teams. 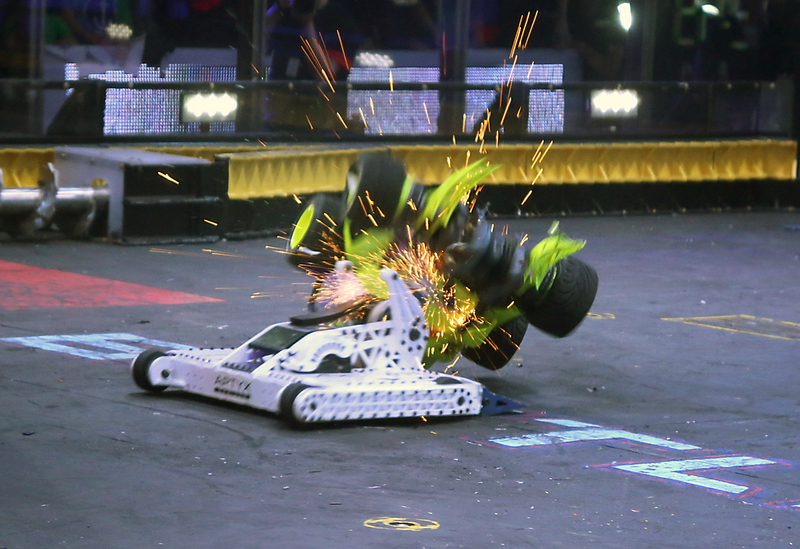 Be sure to watch the BattleBots finale on Friday, October 5th on the Discovery Channel. To learn more about Paul, his company Aptyx Designs, and BiteForce, please follow him on Facebook here.